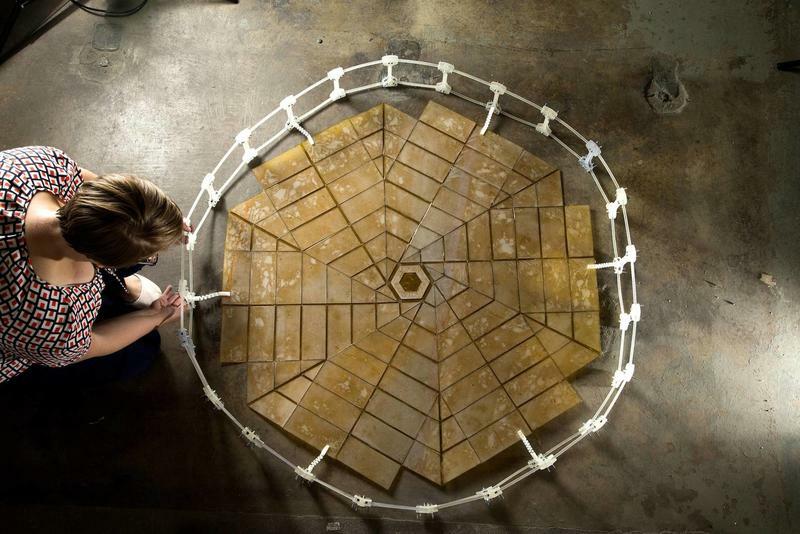 NASA is using the art of origami as inspiration for its newest prototype orbiting solar panels. What would normally be 82 feet in diameter when unfolded has been shrunk down to just 9 feet wide by NASA engineers. The obvious benefit is that folding these panels down makes them much easier to transport, especially when they're supposed to be sent into space. The execution of this prototype design is actually quite brilliant. When folded up, one simple tug of a rope will open these panels like a blooming flower. What has an initial appearance of a mechanical cocoon can bloom into a mature, beautiful solar panel. NASA already uses some cool accordion and fan designs for space missions, but the origami-inspired design is much easier to deploy, and more compact, too. The picture you see above is just a 1/20th scale model, so it's not indicative of the final product. But it shows how new technology can be inspired by an ancient art. Using bulkier materials for an actual working solar panel could prove difficult, but the new engineering method could end up being used with satellites and antennas, giving renewed usefulness to small and large structures alike. You can check out the prototype solar array in the video below. Origami Solar Array Prototype from JPLraw on Vimeo.